Opus Dei is the most controversial group in the Catholic Church today. To its members it is nothing less than The Work of God, the inspiration of Blessed Josemaría Escrivá, who advanced the work of Christ by promoting the sanctity of everyday life. To its critics it is a powerful, even dangerous, cult-like organization that uses secrecy and manipulation to advance its agenda. At the same time, many Catholics admit knowing little about this influential group. Moreover, because of the dichotomy of views on the group, and perhaps because of its influence in Vatican circles, it is difficult to find balanced reporting on Opus Dei. This article is a look at Opus Dei’s activities in the United States. It is based on material written by Opus Dei and its critics, as well as on interviews with current and former Opus Dei members and with priests, religious, laypersons, campus ministers, scholars and journalists who have encountered Opus Dei in the United States. Any look at Opus Dei must begin with Msgr. Josemaría Escrivá de Balaguer, the Spanish priest who founded the group on Oct. 2, 1928. On that day, according to Opus Dei’s literature, while on a retreat in Madrid, “suddenly, while bells pealed in a nearby church, it became clear: God made him see Opus Dei.” Monsignor Escrivá, invariably referred to as The Founder by members, envisioned Opus Dei as a way of encouraging lay people to aspire to sanctity without changing their state of life or occupation. Today Opus Dei sees itself as very much in line with the Second Vatican Council and its renewed emphasis on the laity. Some of the group’s spirituality can be gleaned from Escrivá’s numerous writings, most notably his 1939 book, The Way. The book is a collection of 999 maxims, ranging from traditional Christian pieties (“The prayer of a Christian is never a monologue”) to sayings that could easily have come out of Poor Richard’s Almanack (“Don’t put off your work until tomorrow”). 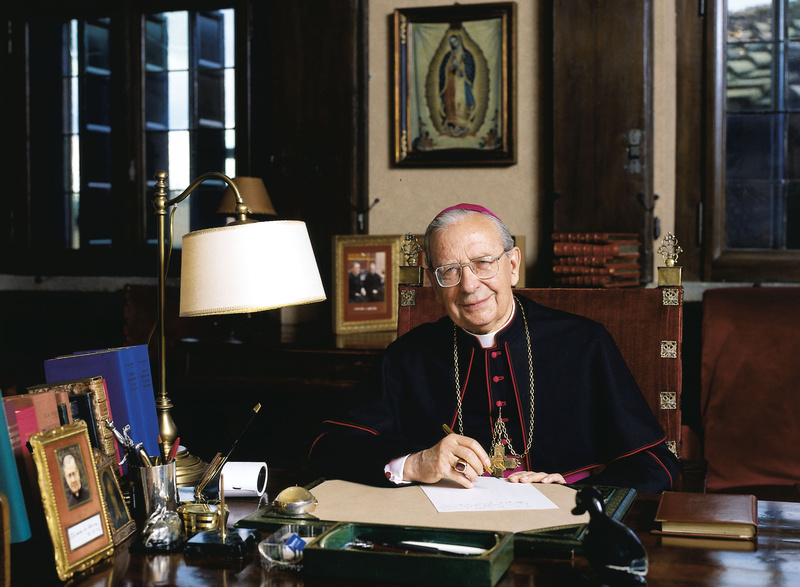 His group grew rapidly, spreading from Spain to other European countries, and in 1950 received recognition by the Holy See as the first “secular institute.” Over the next two decades The Work, as members call it, moved into Latin America and the United States. In 1982 Pope John Paul II granted Opus Dei the status of “personal prelature,” a canonical term meaning that jurisdiction covers the persons in Opus Dei rather than a particular region. In other words, it operates juridically much as religious orders do, without regard for geographical boundaries. This unique recognition—it is the only personal prelature in the church—demonstrated the high regard in which it is held by John Paul II as well as Opus Dei’s standing in Vatican circles. But it also prompted critics to ask why a professedly lay organization would need such a status. Today Opus Dei counts 77,000 members (including 1,500 priests and 15 bishops) in over 80 countries. Countering these claims, Opus Dei’s director of communications in the United States, Mr. William Schmitt, defended the speed of the beatification by pointing to streamlined Vatican procedures and the exemplary life of Monsignor Escrivá. “Just look at the facts,” he said. But even with Escrivá’s beatification, controversy dogs the group. In 1992 Michael Walsh’s book, Opus Dei: An Investigation into the Secret Society Struggling for Power Within the Roman Catholic Church, engendered such a negative reaction from Opus Dei that they published their own book, Opus Dei: An Open Book, to rebut Walsh’s claims. There are over 3,000 Opus Dei members in the United States, with 64 centers, or residences for members, in 17 cities: Boston; Providence, R.I.; New York; South Orange, N.J.; Princeton, N.J.; Pittsburgh; Washington; Delray Beach, Fla.; South Bend, Ind. ; Chicago; Milwaukee; Urbana, Ill.; St. Louis; Houston; Dallas; Los Angeles and San Francisco. This is up from eight cities in 1975. Many of the centers are located near large college campuses, where Opus Dei attracts new members. (For example, the Leighton Studies Center for men and the Petawa Center for women are located in Milwaukee near Marquette University.) Each center typically houses 10 to 15 members, with separate centers for women and men. Opus Dei also sponsors other programs, such as retreat houses, programs for married Catholics and outreach programs to the poor, like its education program for children in the South Bronx. Other activities are run in Syracuse, Philadelphia, Miami, San Antonio, Minneapolis/St. Paul, Denver and Phoenix. Opus Dei operates five high schools in the United States: The Heights (for boys) and Oak Crest (girls) in Washington, D.C., the Montrose School (girls) in Boston, and Northridge Prep (boys) and The Willows (girls) in Chicago. Their retreat houses include Arnold Hall in Pembroke, Mass., the Fetherock Conference Center near Houston and Trumbull Manor near San Francisco. In light of their growing presence in this country, I contacted each of the seven U.S. cardinals and one archbishop requesting comments on Opus Dei for this article. I had hoped in this way to gauge the opinions of the U.S. Catholic leadership. None would comment—either positively or negatively. The majority said they had either no substantial knowledge or no contact with them, though Opus Dei is active in nearly every large archdiocese in the country. It is difficult to read anything about Opus Dei without running across accounts of its alleged secrecy. (“Pope Beatifies Founder of Secretive, Conservative Group” ran a New York Times headline in 1992.) Indeed, while a few members of Opus Dei are well knËwn, like the Vatican press officer Joaquín Navarro-Valls, M.D., most are not. Critics also point out that most of Opus Dei’s organizations are not clearly identified as being affiliated with Opus Dei. But most critics are not concerned about whether members publicly announce their affiliation with Opus Dei. After all, many members of other lay organizations work without broadcasting their affiliations. When critics speak of “secrecy,” they refer instead to frustration in their efforts to get answers about the basic corporate activities and practices of Opus Dei. I encountered perhaps one example of this difficulty in the course of my research. Early on, I asked Bill Schmitt for a copy of Opus Dei’s constitutions. I thought that by reading them I could better understand Opus Dei and lay to rest some misconceptions. He gave me a copy of the 1982 statutes. But they were in Latin, and a technical “church” Latin at that. Could I have a copy of the English translation? There was none, he said. Why not? First he said that Opus Dei had not had sufficient time to translate them. I replied that this seemed odd, given that the statutes had been around for 12 years and that The Way had already been translated into 38 languages. I asked three experts in canon law what that reason might be. One canon lawyer said, “Property of the Holy See? I’ve never heard of such a thing.” Another, John Martin, S.J., professor of canon law at Regis College in Toronto, noted that religious orders and lay associations as a matter of course publish their statutes in local languages, and as far as he knew, “there is no general ecclesiastic prohibition against the translation of documents of religious orders.” Or of personal prelatures, for that matter. Richard Hill, S.J., of the Jesuit School of Theology in Berkeley, Calif., agreed, saying “there is no canonical reason” why Opus Dei should not be allowed to translate their own statutes. So it appears to be Opus Dei, not the Holy See, that is keeping the statutes from being translated. Ann Schweninger is a 24-year-old former Opus Dei member now living in Columbus, Ohio, where she works with the Diocese of Columbus. She was not surprised when I told her of my difficulty in making sense of all this. “Opus Dei plays by its own rules,” she said. “If they don’t want to have something out in the open, they won’t make it accessible.” Referring to her own time in Opus Dei, she said: “The statutes were never shown to me nor were they available. They are mentioned but not discussed.” According to Ms. Schweninger, the only official document available is the catechism of Opus Dei, which even members can read only with the permission of the house director. “It’s kept under lock and key.” She also mentioned that during classes on the catechism, she was encouraged to take notes “in code” in case non-members should read them. To encounter Opus Dei is to encounter dedicated, energetic Catholics engaged in a variety of occupations. It is also to encounter a sometimes bewildering array of priests, numeraries, supernumeraries, cooperators, associates, directors and administrators. Opus Dei describes the various types of membership as different levels of availability for their mission. Critics maintain that Opus Dei, with its emphasis on hierarchy as well as celibacy and obedience, merely replicates religious life while professing lay spirituality. “And they’re really priest-ridden.” claims Newsweek’s Kenneth Woodward. A few basic terms: Numeraries are single members who pledge a “commitment” of celibacy and normally live in “centers.” Numeraries turn over their income and receive a stipend for personal expenses. Numeraries (accounting for roughly 20 percent of the membership) follow the “plan of life,” a daily order that includes Mass, devotional reading, private prayer and, depending on the person, physical mortification. Numeraries also attend summer classes on Opus Dei. Every year an oral commitment to Opus Dei is made, and after five years the “fidelity” is made, a lifetime commitment. There are separate centers for men and women, each with a director. Male numeraries are encouraged to consider ordination to the priesthood. After 10 years of training, those who feel called are sent to Opus Dei’s seminary in Rome, the Roman College of the Holy Cross. Most members are supernumeraries, married persons who contribute financially and sometimes serve in corporate works like schools. Associates are single people who are “less available,” remaining at home because of other commitments, such as responsibilities toward aging parents. Cooperators, strictly speaking, are not members because “they do not yet have the divine vocation.” They cooperate through work, financial help and prayers. Opus Dei also includes the Priestly Society of the Holy Cross, an association of diocesan priests who receive the spiritual help that Opus Dei provides. They remain incardinated in their own dioceses. Numeraries or associates who are ordained priests also become members of this society. The head of Opus Dei, or “prelate,” is currently Bishop Javier Echevarría, who works out of its headquarters in Rome. a lay organization, I’d hate to see a clerical one,” said one of the priests from Princeton. But it is Opus Dei’s way of attracting new members that comes under the most vigorous attack by its critics. Opus Dei contends that their distinct brand of spirituality fills a need in society and that, as a result, Americans are naturally attracted to it. Others disagree, speaking of overly aggressive recruiting tactics. “I call them the Catholic Mormons,” says Kenneth Woodward. One man who attended Columbia University in the early 1980’s, who asked not to be named, described the process of being recruited by Opus Dei. “They had someone become my friend,” he said bluntly. After Mass one day he was approached by another student, with whom he soon became good friends. Eventually he was invited to the Riverside Study Center near Columbia’s campus. He was not certain exactly what it was. “I thought it was a group of students that were a think tank or something.” After dinner a priest gave a short talk. He was later invited to join a “circle,” which he described as a sort of an informal prayer group. Soon afterwards Opus Dei suggested that he take one of the priests at the center as his spiritual director. I asked if they were surprised at hearing that the man at Columbia had been cut off by his friend. “No,” said Tammy recalling her own recruiting days. “They use friendships to get people to join. They call it an apostolate of friendship and confidence, but it’s certainly not confidence—because everything that you talk about with your recruit is discussed with your director.” Even personal matters? “Especially personal matters, because those are the things that you can use so that a person would think about joining Opus Dei.” She was also advised to recruit only “select” people—intelligent and physically attractive—since they would be more likely to attract others once they were members. Opus Dei looks at it differently, stressing the fact that any relationships are entered into freely. “There is no recruitment to Opus Dei,” said Bill Schmitt. It is not in Opus Dei’s interest, he explained, to have anyone as a member who does not freely understand and embrace their vocation. Jim Gabriel agreed. “The word recruiting sounds so bad,” he said. “Like we peg people and then try to get people to join The Work.” He spoke of helping people to come to know Opus Dei through friendship, and had had no experience of coercion. Opus Dei is an increasingly strong presence on U.S. college campuses. Traditionally, their efforts to attract new members has led them to colleges and universities. And it has sometimes led them into conflict with other groups. After students were recruited, said one former chaplain, they would disappear from the regular campus chaplaincy functions at Princeton, “because it was seen as not being truly Catholic.” Father McCloskey also wrote a letter instructing students to avoid certain professors: “If [a course] is given by an anti-Christian its impact is counter-productive.” This led some students to circulate a petition claiming that Father McCloskey’s work was detrimental to the welfare of the university. Father McCloskey denied coercing students into the sacrament of reconciliation but added, “I might have told people they need to go to confession—that’s the duty of the priest at times.” He denied asking about sexual activities. Nor, he said, had he ever recruited for Opus Dei. “I rarely if ever talked about Opus Dei with students.” As for presenting the other chaplains with the list of objective measures, he termed it a “lie.” He also noted that his list of courses were only “recommendations” to Catholic students. In 1990 a new chaplain took over and dismissed Father McCloskey. Opus Dei has since opened a center in Princeton called Mercer House, three blocks from the campus ministry office. A visit to the Riverside Study Center on Manhattan’s Upper West Side provided an opportunity to meet a few numeraries. The center houses 17 men, some studying at nearby Columbia University and other schools, some working in Manhattan. Two Opus Dei priests also reside there. It is a very large but not lavish house, with an ornate chapel, comfortable living areas and medium-sized bedrooms. Dinner was served family style, with much conversation. After dinner I met with the center’s director and three numeraries, along with communications director Bill Schmitt. The men seemed genuinely content with life at the center. Their descriptions of how they were drawn to Opus Dei sounded like any vocation story, and none mentioned any coercion. One, in fact, said that any coercion would have turned him off to Opus Dei and made him less likely to join. Dianne DiNicola, Tammy DiNicola’s mother, knows some things about Opus Dei that she would like to change. In 1991 she started the Opus Dei Awareness Network, a self-described support group concerned with outreach to families with children in Opus Dei. Initially trying to accept her daughter’s decision, she met with Opus Dei officials and diocesan officials to obtain more information. “I was just trying to feel good about Opus Dei. I love my religion. I mean, you’re not talking about the Moonies. This is something within the Catholic Church.” But the situation deteriorated, and Mrs. DiNicola felt that the church either was not in a position to help or did not want to do so. Finally, Mr. and Mrs. DiNicola enlisted the help of an “exit counsellor” and asked Tammy to come home for her graduation in 1990. They later discovered that this would have been the last time she would have come home, since she had already been told to sever contacts with her family. According to both Mrs. DiNicola and Tammy, the counselling enabled Tammy to think about Opus Dei critically for the first time. “It was pretty tumultuous,” recalled Tammy, now 26. She said that since Opus Dei “shut down” all of her emotions, she experienced a flood of emotions after she left. Now Mrs. DiNicola runs the Opus Dei Awareness Network (ODAN), which she says enables her to help to spare others the pain that her family went through. Ann Schweninger was a numerary living at the same center with Tammy and remembered the day of Tammy’s departure. “The whole house was so upset, with everyone crying. The directors were hysterical, too. They told us that we had to pray hard for Tammy since this was her soul at stake and that we would really have to mortify ourselves.” Ann eventually decided to leave on her own, over the opposition of the center’s director, who said that her doubts would blow over. Ann’s own departure was equally painful. After she left, Opus Dei persisted in trying to re-establish contact, calling her at work, sending plaintive letters, notes and Christmas packages. At one point, Opus Dei members—thinking that Ann was staying at a friend’s house—began driving by the house looking for Ann. “It was ridiculous,” said Ann. Eventually, she had a lawyer write to Opus Dei threatening a court order to cease contact with her. Whether Opus Dei will continue to grow in the United States is difficult to predict. Its critics, including ODAN, are gaining a voice. But Opus Dei’s widely acknowledged Vatican influence seems to provide a degree of protection, and its attraction for some, especially among college students, is a reminder of the desire for spirituality among Americans. Members are completely devoted to The Work. “I think it’s wonderful,” says numerary Jim Gabriel. “Belonging to Opus Dei is living the Catholic faith to its fullest,” said one supernumerary. But their critics are equally adamant. “I think they’re very surreptitious, very ill,” said the man from Columbia University. “They don’t really believe in the world,” said Kenneth Woodward. James Martin, S.J., is editor-at-large at America and author of Jesus: A Pilgrimage.